Olivia Culpo was among the guests at the 2018 Sports Illustrated Swimsuit show at PARAISO during Miami Swim Week at The W Hotel South Beach. And she once again wowed with her stunning style. Olivia Culpo has made quite a few strides over the past a couple of years with her fashion style. She continues to impress yet again. Olivia rocked an elegant tight red dress which featured a high neck and an asymmetrical side cut at the shoulder and top. The dress continued with a body-hugging fit all the way to the calves. 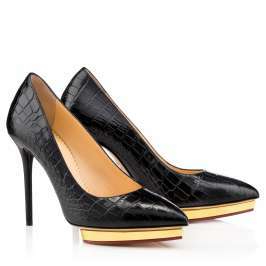 Olivia teamed the elegant piece with a pair of equally stylish golden high heels. They had pointed toes and elegant thin heels. Olivia completed the look with a matching golden clutch. She rocked her hair in a tight bun and opted for heavier, accenting makeup with eyeliner and bright dress-matching lipstick. A few elegant golden jewels completed the red and gold motive for Olivia. Very nicely done.